Perhaps you've noticed. Some people and institutions are working feverishly to convince us that real social change is not possible. Their target is Bernie Sanders and the growing army of his supporters who are fed up with politics as usual and the grip of Wall Street and corporate America on our political, economic and social system. The theme is to desperately convince us that Sanders can't win. They repeat it over and over, even though Sanders polls as well or better than Hillary Clinton does against every leading Republican candidate. Behind this effort is an alarmed corporate old guard that still runs the Democratic Party establishment and their allies in the corporate think tanks and the media, with a special nod to NBC/MSNBC, which is owned and operated by General Electric and Comcast. There's a term that has seeped into the lexicon. Gas lighting. It dates back to a 1938 play "Gas Light" and a 1944 move, "Angel Street." In which an abusive husband tries to convince his wife she is insane by distorting facts -- dimming the gaslights -- and denying the reality (in this instance the changed lighting) exists. Skip ahead 70 years and the concept has morphed from the realm of domestic abuse to the political arena. As a Kos columnist wrote a few years ago, "deliberate manipulation to create a false reality that is used to control the victim" or in this case, social control. In the political world, the goal is to consciously mislead those shut out of political and economic power, to make them distrust their ability to challenge those who hold that power, and demobilize them from acting to change an oppressive system. In this case to blunt the Sanders' surge, and what it represents for the millions of people who want to reverse income inequality, guarantee health care to everyone, break up the banks, carry out meaningful environmental justice and criminal justice reform, and all the other far reaching planks of Sanders' campaign and the coalition supporting it. A thrust of their effort is to persuade Sanders supporters that he cannot win, in large part by using all the well-funded mechanisms in their control to retard wider exposure to the message of Sanders and his allies. The power elite form of turning down the gaslights. Here's a small part of how the manipulation works. The Democratic National Committee slashes the number of debates and schedules debates on Saturday nights when far fewer people are watching, and pressures its elected officials and convention super delegates for an early endorsement in an effort to lock down a coronation of their preferred candidate. Meanwhile the media, in particular NBC/MSNBC which has the biggest network audience of presumed Democratic Party voters, limits coverage of Sanders while it's parent company, GE, also directs its Hollywood subsidiaries, including Universal Studios (co-owned by Comcast) and its NBC shows, to line up its contracted celebrities to endorse the politics as usual campaign. Other national media, which also has a stake in the status quo, contributes as well. 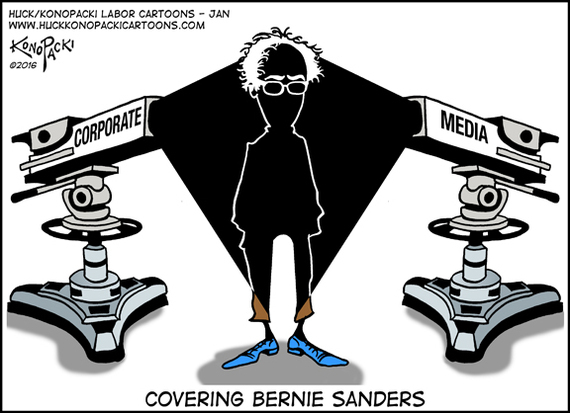 While Sanders has now drawn more than 400,000 people to his rallies - far more than any other candidate - he routinely receives less coverage than most of the other leading candidates. A report, circulated by Media Matters, found that on one network alone Donald Trump has been given 81 minutes of news network coverage compared to less than one minute for Sanders, even though, as the Nation's John Nichols notes, Sanders has broader support among Democratic voters than Trump does among Republicans in the first voting state, Iowa. No, we're not crazy, they just want us to think we are. Nurses know Bernie Sanders can win, and they are holding house parties, joining rallies, participating in on-line actions, in greater numbers than ever, in support of the fundamental transformation the Sanders campaign represents. And then there's the majority of people who want to see a better world. Many of them are young voters who the polls have been unable to hide are overwhelmingly for Sanders. In a fall speech to the DNC, Sanders put it bluntly. "The people of our country understand that given the collapse of the middle class and a grotesque level of income inequality, we do not need more establishment politics or establishment economics." "What we need," Sanders emphasized, "is a political movement that is prepared to take on the billionaire class, a movement that works for all of us and not just the corporate class and a handful of the wealthiest people in this country." It's a message, a campaign, and an uprising that has sent chills through those whose primarily loyalty is to the wealthy donors in mansions and corporate suites and the policy architects on Wall Street. But it's a message that sure has resonated in the grassroots. And, all the efforts to turn out the lights will not stop the momentum for change.